Anthurium cineraceum Croat, sp. nov. TYPE: Colombia. Narino: Pambana, between Río Pimbi and Río Cuembi, on Río Telembi, above Barbacoas, ca. 50 m, ca. 1°35'N, 77°58'W (coordinates added), 3 Feb. 1945, Ewan 16849 (US 2142808, holotype). Planta terrestris aut epiphytica; intemodii breve, 1.5-2 cm longi; fibrae cataphylli persistens; petioli (21-)43-75 cm longi; laminae profunde 3-lobatae, (25-)36-56 cm longae, plerumque siccitatae cinerascens; anguste obovato ad oblongo-elliptico lobo medio, apice acu-minata; nervis primariis lateralis 7-14; falcato lobo lateralibus, (21-)31-43 cm longo, apice rotundato obtuse; pedunculus 8-30 cm longus; spatha linearo-lanceolata, viridis, 17-32 cm longa, 1.1-3 cm lata; spadix (13-) 17-3 3 cm longus, 5-20 mm stipitatus, viridis ad lutea, violaceo purpurea maturitati; baccae ignotae. Terrestrial or epiphytic; stem short, erect; internodes short, 1.5-2 cm long, turning reddish brown, persisting in a shredded condition or as naked fibers. LEAVES with petioles (21-)43-75 cm long, subterete, sulcate above at least near apex; geniculum 1-1.5 cm long; blades deeply 3-lobed to within 5-8 cm from the base, drying papyraceous, usually greenish gray, matte, (25-)36-56 cm long, weakly attenuate to broadly rounded at base; medial lobe narrowly obovate to oblong-elliptic, acuminate, broadest in the middle or distal two-thirds, 6.8-18 cm wide, broadly confluent with lateral lobes, primary lateral veins (medial lobe) 7-14, raised on both surfaces, especially on the lower surface, lower ones arising at ca. 60-70° angle, upper ones at ca. 30-40° angle, promptly curving upward and running nearly straight to the collective vein, interprimary veins few, collective vein arising from the lower one-third of blade, 3-6 mm from margin, sunken above, prominently raised beneath; reticulate veins drying conspicuously raised on lower surface; lateral lobes falcate (21-)31-43 cm long, 6-14 cm wide, bluntly rounded at the apex, inner margin weakly concave, outer margin broadly rounded; basal veins 3-4, 2-3 of them coalesced 4-5 cm; posterior ribs straight, forming a 90-130° angle with each other, not at all naked (weakly naked in Panamanian material). INFLORESCENCE with peduncle 8-30 cm long, terete; spathe spreading, linear-lanceolate, 17-32 cm long, 1.1-3 cm wide, green, drying brown, matte, caudate-acuminate at apex, decurrent 6-12 mm; spadix (13-) 17-3 3 cm long, gradually tapered to apex, 6-10 mm diam. (dried), green to yellow at anthesis becoming violet purple; flowers rhombic, 7-12 per spiral, 2-2.4 mm long, 1.7-1.9 mm wide; lateral tepals 1.2-1.3 mm wide, inner margin broadly rounded; alternate tepals with inner margins concave; stamens not cxsert-ed. INFRUCTESCENCE not seen. Fig. 170. Anthurium cineraceum occurs in eastern Panama and western Colombia in the Departments of Choco and Narino from near sea level to 950 m in tropical wet, premontane rain, and pluvial rain forest life zones. The species is in section Semaeophyllium and is distinguished by its deeply trilobate leaf blades that dry grayish (hence the name cineraceum from cineraceous, meaning ash-grayish). It also lacks the naked posterior rib characteristic of Anthurium garagaranum. Colombian material of the species is generally described as being terrestrial while Panamanian collections are epiphytic. Panamanian collections also differ in having blades that dry less decidedly grayish and may have the posterior rib briefly naked near the petiole. Anthurium cineraceum is most easily confused with A. garagaranum, which diners in having spadices that dry semiglossy and blackened with more flowers per spiral (12-15). The leaf blades usually dry dark brown and have a prominently naked posterior rib along the edge of the sinus. 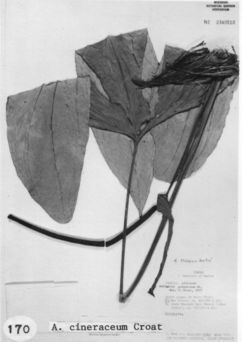 Anthurium cineraceum may also be confused with A. insigne Mast., another Colombian species with deeply three-lobed leaf blades, but the latter differs in having leaves that dry brown to reddish brown and stamens that are exserted at an thesis. A juvenile plant (Triana 1702) collected in "Barbacoas i Choco" at "Centra de Vivero" at 200 m in May 1933 is probably also this species. Panama Darien: Cerro Pirre Region, 1000 m,, , Al Gentry 4602 (DUKE, F, MO). Panama Darien: Cerro Pirre Region, 300-700 m,, 4 Apr. 1975, Mori & Kallunki 5385 (MO). Panama Darien:, , Kirkbride & Duke 1347 (MO, NY). Panama Darien:, 1 May 1968, Kirkbride & Duke 1348 (NY). Panama Panamá: 700-750 m, 9.15N 79.25W, 19 June 1988, Thomas B. Croat 68682 (MO). Panama San Blas: 350 m, 9.19N 78.55W, 8 March 1986, Greg de Nevers & Heraclio Herrera 7292 (MO). Colombia Choco: Río Torito (branch of Río Habita), 850-950 m,, , Forero et al. 7385 (COL, MO). Colombia Choco: Río Torito (branch of Río Habita), 730-830 m,, , Forero et al. 6534 (COL, MO). Colombia Choco: 100 m,, , Gentry & Brand 36868 (MO). Colombia Choco: 40 m,, , Forero et al. 1268 (COL). Colombia Choco: 60 m,, May 1833, Triana 1702A (COL). Colombia Choco: Río San Juan, 5 m, 4.10N 77.10W, , Forero & Jaramillo 4455 (COL, MO). Colombia Narino: 50 m,, 23 Nov. 1981, Al Gentry et al. 34885 (COL, MO). Colombia Narino: Río Telembi, 50 m,, 3 Feb. 1945, Ewan 16849 (US). Colombia Narino: 260 m,, 14 June 1992, Gonzales 184 (COL). Colombia Valle del Cauca: Bajo Anchicaya, 300 m, 03.45N 76.50W, 20 Oct 1989, A. Gentry, O. Rangel & Curso Postgrado-Botánico 68603A (COL, MO).